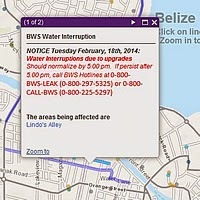 Here's a simple but fabulous GIS application developed by the Belize Water Service (BWS) and TBSL on ArcGIS Online, showing how to reliably and more easily inform citizens about mundane but important city administration actions. (Where there's a will, there's a spatial dataset and ...). This is what a Spatial Data Infrastructure (SDI) means to our fellow citizens - really useful information. Thanks Emil. P.S. The situation information is live, and may change tomorrow.